Distribution and Habitat: Cyclamen persicum is a species of flowering herbaceous perennial plant growing from a tuber, native to rocky hillsides, shrubland, and woodland up to 1,20 m (3,900 feet) above sea level, from south-central Turkey to Israel and Jordan. It also grows in Algeria and Tunisia and on the Greek islands of Rhodes, Karpathos, and Crete, where it may have been introduced by monks. Cultivars of this species are the commonly seen florist’s cyclamen. Availability: Cyclamen persicum is a tuberous-rooted flowering plant best treated as temporary indoor plant, to be brought into home just as the buds begin to open, enjoyed wile flowering and discard wen the flowering is over. 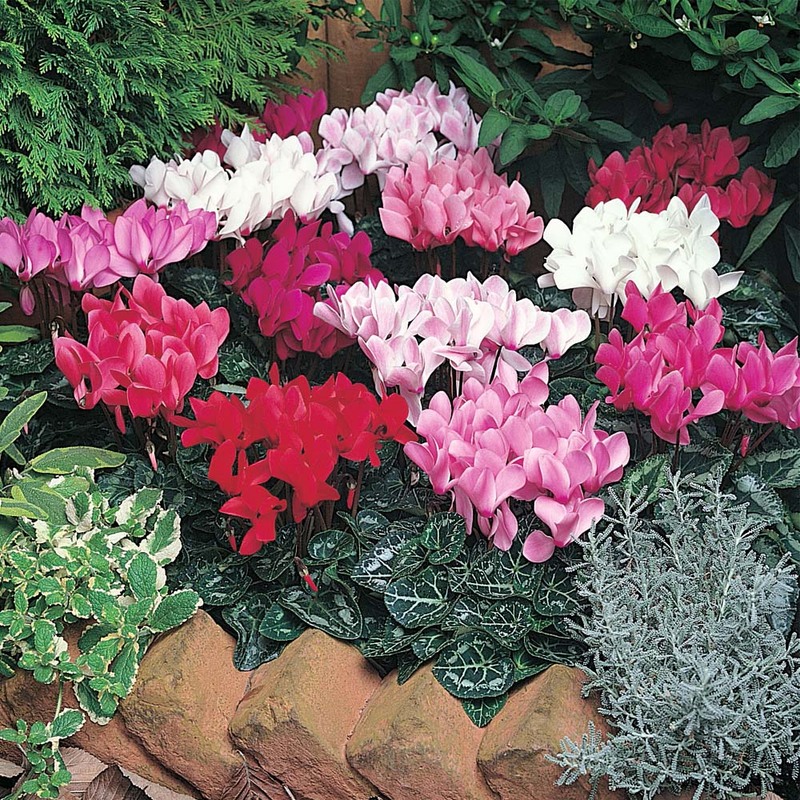 Cyclamen persicum is often seen for sale throughout the fall and winter, in less hardy zones, as a houseplant. Plants which are already in bud normally appear on the market from about early winter until spring in hardy zones. Bought plants should remain decorative for two or three months. Plants are usually bought in 8cm (3 inch) or 12cm (5 inch) pots. Description: Numerous flowers, produced on individual stalks 23cm (9 inch) long or more, comprise several petals – of which there are usually five – standing almost erect. The flowers may be pure white, deep red or various shade of pink, salmon, mauve and purple. Some have white edgings on the coloured petals; some have ruffled petals edges and some more closely resemble the wild species in that they are small, delicate and pleasantly perfumed, whereas most cultivated forms have no perfume and have flowers 2cm (0.8 inch) or more long. The flowers stalks of Cyclamen persicum plants rise up among leaves that are variably market in silver, sometime with a wide silver margin or irregular silver marbling. The leaves have 10cm (4 inch) long leaf-stalks that rise directly from the flattened, corky tuber of the plants. Cyclamen persicum can flower for two to four months, with individual blooms lasting up to three weeks. Once flowering stops, the plants can survive for several more months. Houseplant care: Remove dead flowers as they fade and is important to remove the entire flower stalk along with the flower. This is easily done by twisting the stalk and pulling sharply. Any damage or yellowing leaves should also be cleanly pulled away. When the plants have finished producing flowers, they can be discarded. However for those who wish to attempt to bring a Cyclamen persicum into flower another year, proceed as per “Dormancy period instructions” below. Light: Cyclamen persicum should be given in the winter – during the flowering period – bright light without direct sunlight . While the plant is dormant during the summer, keep it out of bright light. Temperature: Keep Cyclamen persicum cool at all times. A temperature of between 13°C (55°F) and 18°C (64°F) is ideal, if possible. Warm conditions will greatly shorten the life of these plants, but plenty of humidity improves matters; this can be achieved by placing pots on trays of moist pebbles or an individual pot can be kept in a bowl of moist peat moss. Avoid drafts as well as hot, dry air. Do not expose to temperatures below 10°C (50°F). Water: Cyclamen persicum tubers are only half-buried in potting mixture and water should never be poured onto the tubers, which are liable to rot. Instead plants should be watered from below by placing the pot in shallow water-filled bowl; this permits the potting mixture to take up as much water as it needs. After ten minutes the soaked pots should be lifted out and allowed to drain. Some growers put the pot of Cyclamen persicum on thin pieces of wet foam rubber (or fiberglass), which is kept moist being placed in a shallow saucer or bowl of water; from this the plant automatically takes up its water needs. This is also an alternative way to achieve high humidity. Fertilising: Apply liquid fertiliser about once every two weeks. Dormancy Period: Cyclamen generally go dormant for the summer. They do not like the lack of rain and excess heat, so they take a siesta. By middle of spring Cyclamen persicum start getting tired and the leaves will begin to yellow and die. When they go fully dormant depends on their growing conditions. If they are houseplants and the heat is kept high, they will peter out more quickly. On the other hand, some of them do not ever appear to go fully dormant. During the summer, dormant cyclamen can be kept indoors, in a cool, dark spot with good air circulation or outdoors, in a shady spot. If placed outdoors, make sure to turn the pot on its side to keep the rain out. If the soil gets too wet during dormancy, the tuber will rot. A little water is not going to do any harm, but the soil cannot remain wet. Repot with fresh soil and a slightly larger pot while the plant is dormant. Cyclamen persicum does best planted in a soil-based potting mix, with the top of the tuber just slightly above the soil line. Begin watering again in early autumn. By then the plant is starting new growth. Move the pot indoors before a frost. In warm climates can use Cyclamen persicum for their perennial gardens. While Cyclamen persicum is more popular as a potted plant, can be used as cut flower. Cyclamen cut flowers last in a vase for a surprisingly long time, two weeks or more, and offer the advantage of having a wide range of bright or soft colours at a time when there is not much choice, during the winter. They prefer pure water (neither gel nor a preservative). The stems must be cut back regularly at the base and cut into buttonholes lengthways (about 2cm (0.8 inch)) before being put back in the vase.